Air travel sends all sorts of seemingly well adjusted peopled into panics. Will the plane catch fire? Will there be a terrorist strike? Will the pilot have a heart attack and the plane go down? Will the plane run out of fuel because of bad weather? Or as in recent headlines, will parts fly off the plane and will the air traffic controller be asleep? You are not alone. Approximately twenty-five million people in the U.S. and millions more worldwide feel anxiety about flying. Sandra M. Pollino, M.S. Ed., Psy.D, has helped thousands overcome their fear of flying utilizing her unique background as a counselor/psychotherapist, nurse and former flight attendant to provide an encompassing approach to conquering the fears and to successfully fly fear free once and for all. 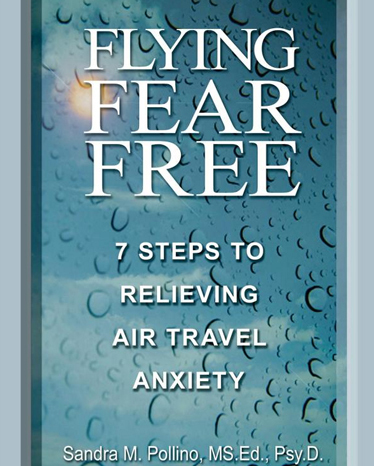 Flying Fear Free: 7 Steps to Relieving Air Travel Anxiety begins by explaining the causes of the fear of flying and defining the associated phobias (claustrophobia, aerophobia), then it gives proven solutions, the benefits of aromatherapy and color therapy, effective exercises and checklists to help relieve the stress and simple relaxation techniques, fun exercises and other effective methods to incorporate to fly more comfortably and fear free. How To Overcome Fear of Flying: The Cure For Fear of Airplane Flights: Conquer Your Fear Flying!